As companies aggressively invest in a future driven by intelligence – rather than just more analytics – business and IT decision makers are increasingly frustrated by the complexity, bottlenecks and uncertainty of today’s enterprise analytics, according to a survey of senior leaders at enterprise-sized organizations from around the world. “Unicorn” data scientists are a bottleneck: Only 25 percent said that, within their global enterprise, business decision makers have the skills to access and use intelligence from analytics without the need for data scientists. The explosion of technologies for collecting, storing and analyzing data in recent years has added a significant level of often paralyzing complexity. The primary reason, cited in the survey, is that technology vendors generally don’t spend enough time making their products easy for all employees to use and understand. This problem is further exasperated by the recent surge and adoption of open source tools. About three quarters (74 percent) of respondents whose organization currently invests in analytics said that the analytics technology is complex. Nearly one out of three (31 percent) say that not being able to use analytics across the whole business is a negative impact of this complexity. 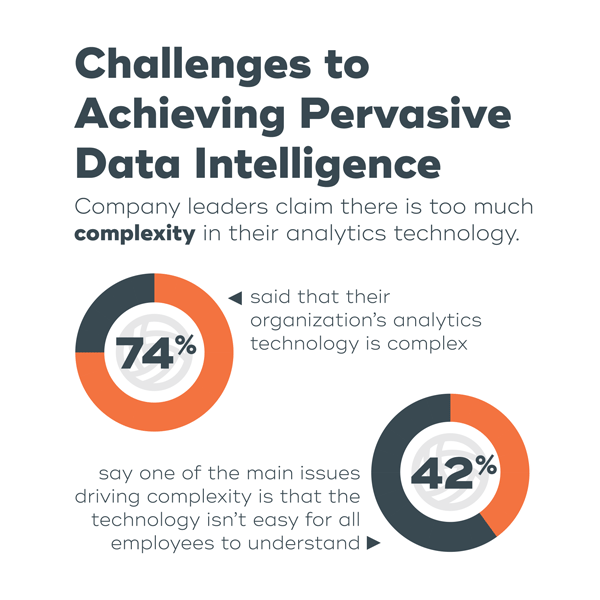 More than half (53 percent) agree that their organization is actually overburdened by the complexity of analytics. One of the main drivers of this complexity is that the technology isn’t easy for all employees to use or understand (42 percent). The survey further found that users need access to more data to do their jobs effectively. 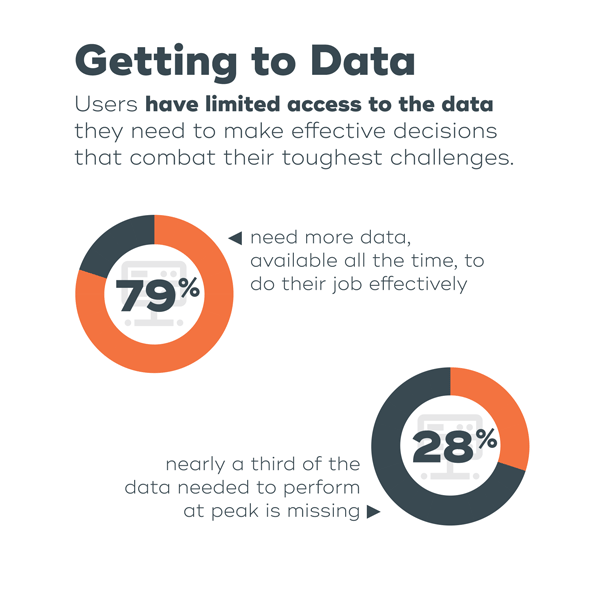 Decision makers and users understand that more data often leads to better decisions, but too often, a lack of access to all the necessary data is a significant limiting factor for analytics success. According to the survey, decision makers are missing an average of nearly a third of the information they need to make informed decisions – an unacceptable gap that can mean the difference between market leadership and failure. More than half (54 percent) of respondents said their organization’s IT department is using analytics, compared to less than a quarter (23 percent) who said that the C-suite and board level are doing so. 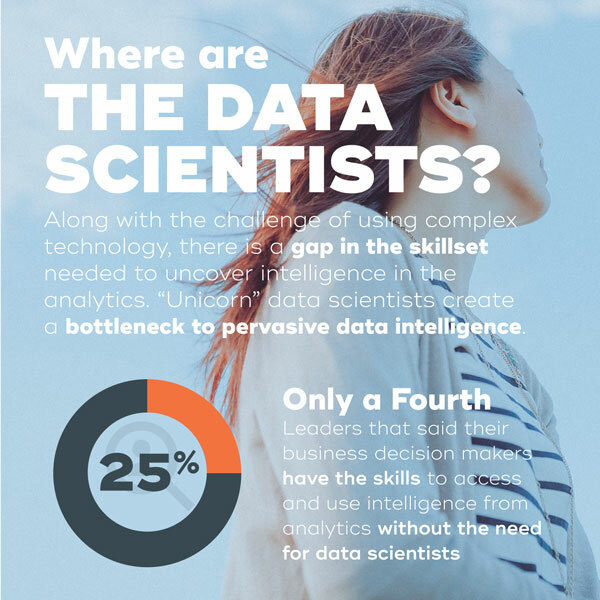 Only 25 percent of companies said their business decision makers have the skills to access and use intelligence from analytics without the need for data scientists. In 75 percent of respondents’ companies, data scientists are needed to help business decision makers extract intelligence from analytics. To reduce this over-reliance on data scientists, 94 percent of respondents’ businesses where data scientists are currently needed, are investing – or plan to invest – in training to enhance the skills of users; while 91 percent are investing – or plan to invest – in easier-to-use technology. The global survey was conducted in August and September 2018 among 260 senior business and IT decision makers in the Americas, Europe and Asia Pacific. Respondents’ organizations had 1,000 employees or more, were from any public or private sector, and had a global annual revenue of $250 million or more (with 69 percent of respondents from companies with at least $1B in global annual revenue). Interviews were conducted online or via telephone using a rigorous multi-level screening process to ensure that only suitable candidates were given the opportunity to participate. Download the full report at teradata.com.